As a very ardent user of Facebook, at times I would want to share some of my posts instantly to Twitter, Instagram or my blogs, but I just can’t. All I do is do a fresh post on those platforms as I am doing now. Yeah, I earlier posted this request on my Facebook wall, but I can’t share on my blog right now. Now, if you make a TWEET, you can copy the link and share on Facebook and it appears nice, as it comes with a snippet and thumbnail of your post. That’s not bad at all. Someone said it’s a business strategy of FACEBOOK Company for some reasons he stated which I don’t think is true. I just need quick and instant sharing of my posts from Facebook to some other social media platforms. 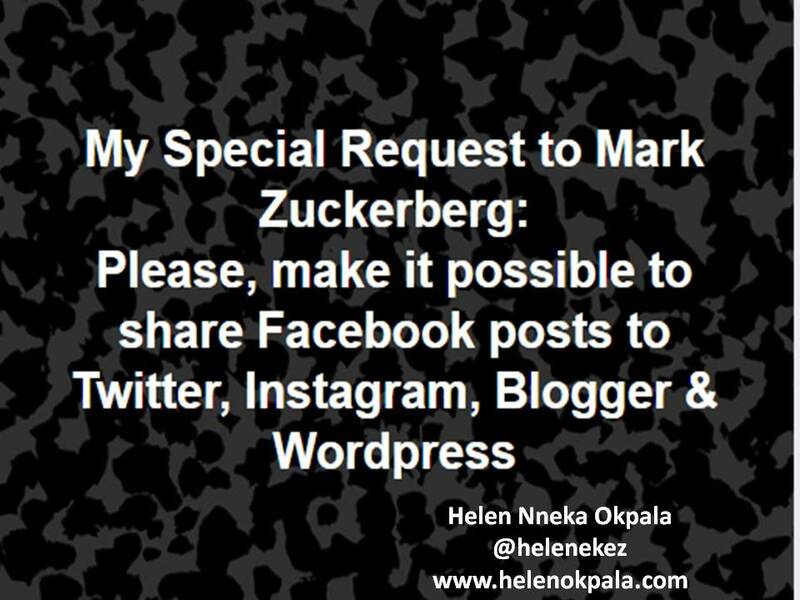 That’s all I ask from Mark Zuckerberg. If you share same thoughts with me, please share this post on your Twitter, Blog, Facebook pages, profiles and groups. This will save lots of time and help in spreading news very fast.